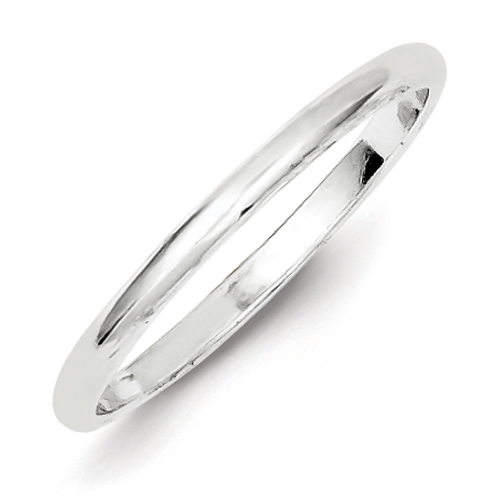 Sterling silver 2mm wedding band has an oval center and polished finish. Made in USA. Thickness: 2.0mm. Available in half and whole finger sizes only, 4-12. Size 7 ring weighs approximately 5.0 grams. THIS IS MY WEDDING BAND...!!! Hello I purchased this beautiful wedding band to use as my wedding band. I have loved wearing it and get a LOT of compliments on it..! THANK YOU..!!! It was a present and I love it. This is worn to replace my wedding ring that was lost. Thought I wanted a very thin band until I saw it on.NOT YOUR FAULT. Delivered exactly what I ordered and speedy at that!